OAKS, PA – The third and final day of the PPB Motorsports 2016 Race Car & Trade Show Presented By Insinger Sunoco was a day dedicated to the youthful race fans with all children entering the show free. 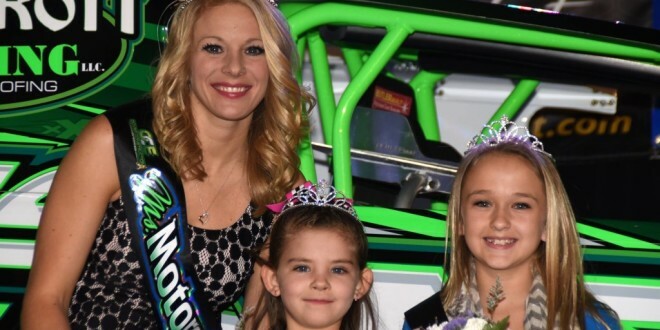 Events for kids, sponsored by Mark Blackwell’s Metal Fab of Pennington, N.J., included two pageants, Little Ms. Motorsports, and Tiny Ms. Motorsports and Big Wheel racing competitions for various age brackets. Arynne Moody, Ms. Motorsports, began her official reign this day, greeting the various award winners in this year’s show as selected by a panel of judges after show closing Saturday. Outstanding exhibitors were honored Sunday morning, as chosen by a panel of Show judges. Best Commercial Booth was awarded jointly to Art’s Radiator and Jones Racing Products. The two companies work closely with one another in developing products to both cool and maximize engine efficiency. Art Lentini and CJ Jones’ booths were opposite one another and were joined overhead by a connector that straddles the aisleway, a first for the Motorsports Show. Best Race Car Display was awarded to Troyer Race Cars. 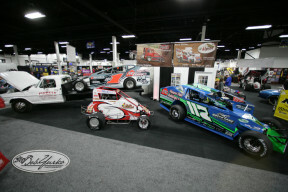 Front and center in the Troyer booth were Jimmy Blewett’s new Asphalt Modified and Mike Mahaney’s new Dirt Modified. Neither car had been unveiled prior to the show opening Friday. Troyer’s Bill Colton drew large crowds of curious, among them many existing customers. 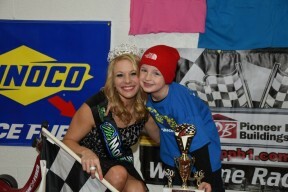 Blackbird Speedway, Delaware’s Quarter Midget track, was recognized as having assembled the Best Quarter Midget booth. The TSRS 305 Sprint Car group and its President Joe Grandinetti were lauded for creating the Best Speedway / Sanctioning Organization booth. Race Car award winners were Matt Campbell’s No. 16 Sprint Car that was part of the Susquehanna Speedway booth, Brett Kressley’s No. 19K Dirt Modified that was set up Brett Deyo’s Short Track Super Series exhibit, and the Mike Clayboss Chevelle dragster that was part of the Insinger Sunoco display. Vintage car awards were presented to the artfully restored No. 14 Dirt Modified driven by the late Bob Toreky, to the unrestored 100 year old Open Cockpit machine that had been handled with tender loving care in the hands of a succession of owners for over a century and is now owned by Norman Hutton of Franklin Lakes, N.J., and to Tri State Vintage for Vintage Club display excellence. Exhibitors reported brisk business on the closing day of the three-day Motorsports Show. First time exhibitor Jason Leindecker of Leindecker Racing Engines, Center Valley, Pa., spoke for many exhibitors with his comments. Haylie Hammond, 11, was named Little Miss Motorsports with Sydney Mancini, 10, first runner-up. Payton Rogers, 5, was named Tiny Miss Motorsports with Jayde Pratt, 4, first runner-up. In Big Wheel racing action, Logan Watt, won for the fourth straight year in Big Wheel racing, this year in the 7 to 9 age bracket. Travis Ford and Abby Petter were second and third. TK Gursky won the 5 to 6 year age group feature ahead of Brian James Pickell and Lane Anderson. Kendall Maccarone outran Bowen Pickell and Shane Sammons in the 3 to 4 age group feature. Event producer Len Sammons was pleased with the Show. “This year’s show had more cars than ever before, and, to me, looked great, even with a couple of late cancellations. I am also very happy with the job the Expo Center did with snow removal Sunday morning,” Sammons said. Dates for the PPB Motorsports Race Car & Trade Show Presented By Insinger Sunoco will be announced shortly.